University teachers experiment all the time with innovative ways to involve students more deeply in learning, but games are rarely part of their toolkit. They may be missing a golden opportunity. You are a vice-president for fictional, Toronto-based Blink Mining, with operations in Northern Ontario. The Sparkle Mine’s general manager sends an email: the mine has received a bomb threat. Pat Stone, the CEO is on a commercial airline flight and won’t be available for the next two hours. It’s up to you and your executive colleagues to figure this one out. As you begin to make key decisions (should you close the mine? use a private bomb squad or the military? ), emails, text messages and social media alerts begin to converge onto your smartphone and laptop. Each new message – from an angry investor to an inquiring reporter to a concerned government minister – adds a new permutation to the crisis, requiring your response and growing in intensity and frequency if you don’t respond within 10 minutes. So goes the scenario for the game-like digital simulation its creator, Mary Waller, first dubbed Crisis Match. When she designed the simulation in the summer of 2012 as the final exercise for students studying crisis management at York University, it was her answer to traditional business-school case studies that she felt weren’t dynamic enough to give her students a meaningful learning experience for dealing with a true crisis. Using a digital storytelling platform called Conducttr, she constructed a complete and realistic narrative that would unspool across a variety of digital and social media at fixed, pre-scheduled intervals. She built a website for Blink Mining with key corporate facts. Students were divided into teams and assigned specific company roles. They provided their email and social media addresses in advance so that all relevant information could be sent to them directly during the two-hour, pressure-cooker exercise. While Crisis Match is considered a simulation, with no simple measure for who wins or loses, it has the feel of a well-constructed, team-based, immersive game that participants know is fictional yet experience as real. Meanwhile, each student leaves a digital footprint of their responses and reaction times that the professor can later use for assessment purposes. In an era when universities are seeking out innovative ways of engaging students and guiding them towards deeper mastery of curriculum material, games and anything that smacks of them are seldom found in the teaching toolkit. 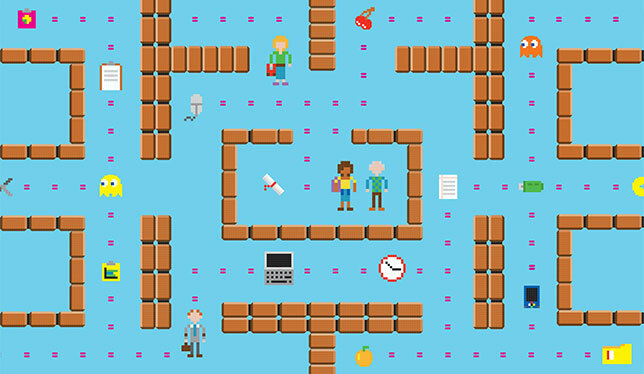 Technology-based, game-like simulations, such as Dr. Waller’s creation, are slightly more common, mostly in business schools and health education, but are far from the norm. Meanwhile, it’s clear that many students turn to digital games when they’re not in class (and, horrors, maybe even when they are). Some 57 percent of Canadian Internet users aged 16 to 24 reported playing online games in a 2013 Statistics Canada survey. Universities may be missing a golden opportunity. The research suggests that including games – digital or otherwise – in learning can help students review and integrate information from diverse sources and develop reasoning skills. Some games can help students resolve cognitive conflicts by letting them test potential problem-solving strategies and see which ones work. Cooperation and communication, considered critical skills by employers, are also triggered by games requiring multiple players who must work together to achieve a mission. David Kaufman, a Simon Fraser University education researcher, says that gaming’s pedagogical possibilities represent “an untapped potential” for postsecondary classrooms. He and researcher Louise Sauvé from TELUQ, the distance education arm of Université du Québec, spent five years investigating theories and practices about how people learn through games and simulations, in a project known as SAGE (for Simulation and Advanced Gaming Environments for Learning) funded by the Social Sciences and Humanities Research Council. Among SAGE’s findings (which were packaged into a book published in both languages) was that games can fire up motivation and can develop cognitive abilities, psychomotor skills and positive attitudes. Games are used to best advantage pedagogically when the teacher understands the different attributes of various kinds of games for achieving their goals. Researchers active in the gaming field, such as Drs. Sauvé and Kaufman, often distinguish between games, simulations and simulation games. They may also draw a line between commercial video games and “serious” games with specific educational or training applications. A game is an activity that is not based in reality, with clear rules governing how to play and winning or losing. It can be used with a particular teaching unit to review or apply curriculum content or even introduce a new concept that can be discussed in class later. A simulation game uses realistic situations as the basis for its storyline, but still has clear rules and may involve competition. A teacher might also introduce game-like elements (sometimes called “gamification”) such as a system of points or badges to reward or acknowledge different kinds of participation. Gamification is taken to the extreme when professors turn entire courses into a game environment. Instead of earning marks, students might get “XP” – short for “experience points” – and gradually “level up” to better grades by accumulating more points for progress along the way. Lee Sheldon starts his book The Multiplayer Classroom: Designing Coursework as a Game by describing the look of blood-draining shock on his students’ faces when he began a course in game design at Indiana University by telling them they all had an “F.” The mood started to shift when Mr. Sheldon (now teaching at Rensselaer Polytechnic Institute in upstate New York) went on to explain that the F was to indicate that everyone in the class was starting out as level-one avatars (or characters) with zero XP. The semester would be their chance to level up to an A. When he taught at Ryerson University, David Chandross noticed that students who did poorly with conventional lecture-based classes tended to perform a full letter grade better after he transformed a human anatomy and physiology course aimed at first-year nursing and midwifery students into one based around a game he’d created called Healer’s Quest. In this experiment, from 2001 to 2003, Dr. Chandross continued to give a one-hour lecture during each three-hour class, twice a week. But now the bulk of the course was spent playing the competitive, non-digital multi-player game. He divided the class into teams of five or six healers. Each healer took a role with specialized abilities, and those roles expanded with their achievements. Adopting game-type terminology, the roles included alchemists (able to do lab tests), seers (imaging specialists), herbalists (clinical pharmacologists) and hygeians (biologists, anatomists, physiologists). Teams were faced with diagnostic and treatment dilemmas for their “seekers” (imaginary patients) – developed from a textbook of emergency medical cases – and had to attend to their needs, armed with the team members’ specialized skills and knowledge learned from their textbooks. The object was to help as many seekers as possible within each month-long round. Wrong moves were costly; teams were restricted by the number of attempts they could make, the skills of their team members, and how many medical resources they could access. Those options improved with achievements. The more cases and more difficult cases that a team solved, the more resources they could access. Grades of more than 80 percent on the course’s mandatory quizzes, based on lecture content, brought points too. Dr. Chandross, who later worked with Dr. Kaufman on the SAGE project, took it a step further so that teams could opt for a limited number of extra quizzes, all in the pursuit of “levelling up” their members’ abilities. Students still had to write a mid-term and a final exam, together worth 60 percent of the mark; 40 percent was for participation and game-related quizzes. But after playing hours of Healer’s Quest, they were already well ahead in their understanding and mastery of content, he says. While use of games and game elements is growing in higher education, it’s “patchy at best,” says Jennifer Jenson, a pedagogy and technology professor at York University and director of its Institute for Research on Digital Learning. That’s because, all benefits aside, “we don’t really have any great proof that [games are] any better than any other pedagogical approach,” she says. Trying to get the proof is a challenge. There are serious obstacles, both ethical and practical, with conducting randomized control studies into whether students do better with one kind of learning approach versus another, explains Suzanne de Castell, dean of education at the University of Ontario Institute of Technology. She and Dr. Jenson are doing a five-year study that attempts to fill the gaps in evidence on the efficacy of video games as educational tools while also identifying the best methods to study that. Called “Prove It To Me,” the study considers the effects of educational games, popular digital games and creating games, and identifies ways to measure how they promote learning – especially learning that sticks over the long term. Besides the evidence challenge, developing and integrating games into a university classroom can be extremely labour- and cost-intensive. Dr. Jenson believes that is changing but it will take time. To bring down the costs in time and equipment, the SAGE project designed a series of online game shells, that instructors can easily customize to their own curricular needs. The shells (provided by the Society for Lifelong Learning that Dr. Sauvé directs) are based on traditional “frame” games like tic-tac-toe and snakes and ladders. The student must correctly answer questions about course content to advance on the board, making such games ideal for pre-test study. The SAGE shells have been used to create games for a wide range of courses, including English literature, physics and memorizing anatomy for medical students. As much as universities want to promote innovative teaching, they may draw the line at games, says education professor David Hutchison. That’s because of “this notion that higher education is serious business,” says the director of the Centre for Digital Humanities at Brock University and author of Playing to Learn: Video Games in the Classroom. Dr. Hutchison says he regrets that some educators seem to believe that a curriculum with game elements puts the integrity of the subject matter at risk, trivializing it in favour of fun. It’s an understandable concern, but these academics think that it is a false dichotomy. Dr. de Castell believes, and tells her students, that “it is in play where we are our best selves.” Let the games begin.